Dustin Jackson - Oddo Brothers CPAs - since 1979! 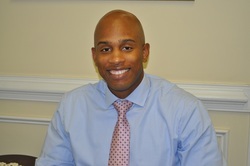 Dustin M. Jackson, a 2005 graduate from Georgia State University with a BBA degree in accounting, joined the staff in December 2007. He prepares both individual and corporate tax returns, payroll tax returns, and sales tax returns. Dustin assists with clients´ bookkeeping needs and other needs such as setting up clients for EFTPS and Georgia online tax payment and form filing needs. He is currently studying to sit for the CPA examination.